The plot of the novel from the “Decameron” Boccaccio, combining cruelty and courtesy, impressed the tastes of customers from the court circle of the Medici. The story tells how a rich young man from Ravenna named Nastaggio degli Onesti fell in love with a girl who belonged to the more famous Traversari family. The lover was arrogantly rejected by the beauty. The young man fell into despair and retired to Chiassi near Ravenna. There he, walking in a grove, immersed in dreams of his lady of the heart, came across a horrifying sight. Two dogs pursued and bitten a naked girl, and behind it a rider with a sword was chasing, threatening with death. Nastajo grabbed the branch of a tree to save the unhappy girl, but heard from the rider the story of his suicide from unhappy love. Once after death in hell, the obstinate girl, cruelly rejecting the lover, is doomed to run away from him forever, and he – again and again to kill his victim and throw her cold heart to devour the dogs. 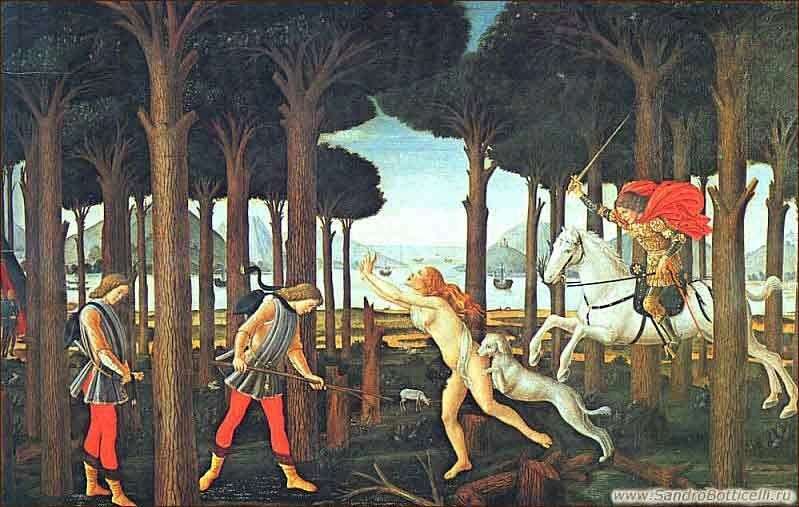 Description and meaning of the painting Novella Boccaccio “Nastagio degli Onesti” the first episode by Sandro Botticelli.